First this will be an on going blog about my home automation experience. So check back often to see how things are going. I want to automate some light bulbs, door locks, garage door, window blinds, and some appliances/electronics. I want to start my home automation my adding a Wink Relay – Smart Home Wall Controller . I first when to Home Depot to pick up a wink relay for $199.95 but when I went to the check out line they wouldn’t give me my 10% military discount. So I said that I wouldn’t purchase the item and instead would order on line at a cheaper cost. I checked with Amazon first but they didn’t have much of discount as they wanted the same $199.95 at first but over time the price dropped about $10. So I tried a few times to purchase one with a bid on eBay but never got the winning bid. Then I found one on eBay that I could purchase and it was only $144.95. So I purchased it and it should be here this weekend. I also wanted to purchase a GE Link Starter Kit, PLINK-SKIT, Wireless, A19 LED Light Bulb at Home Depot but because they wouldn’t offer me my 10% military discount for the Wind Relay I decided to order on line. I check on eBay and Amazon. Both had them for the same price so I ordered from Amazon as being a prime member on Amazon I get my two day shipping for free. I received my order today. I ordered the starter kit because it is cheaper for two bulbs than if you order two bulbs separately. Also a two bulb pack on Amazon is really high, like the price of three bulbs. 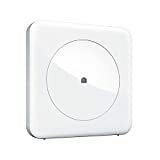 Since I save about $50 ordering the Wink Relay from eBay I also decided to order the Wink Connected Home Hub which I don’t need right now but I will need when I order by window blinds. Again I checked the prices on eBay and Amazon and decided to order from Amazon and I received it today also. I plan on setting up the hub and the light bulbs tonight. So check back in a day or so and I will let you know how the installation and setup went. I finally got my Wink Hub updated and working. Got my Wink Relay installed also. Now I can control my living room lights and ceiling fan. The lights include the ceiling fan lights and two table lamps. The two table lamps use the bulbs shown above and can also be dimmed. I purchased the starter kit because with the two light bulbs it is cheaper than purchasing two of the bulbs separately. I didn’t need the controller that comes with the starter kit as I have the Wink Hub. I also purchased an Egg Minder as shown above. Now I know how many eggs I have at home and which egg is the oldest so you would use the oldest egg first. My next project is to add an electronic dead bolt on my front door. I will add to this post once I get it installed. Finally got my Schlage Connect Camelot Touchscreen Deadbolts installed. The install was pretty easy. Just had to replace my existing deadbolts on my front and back doors. Then I connected them to my link relay which also was pretty easy, just follow the instructions in the wink app. I also replaced my lower door knobs with locks with one without a lock. Call Liberty Locksmith of Calgary if you need to replace the locks too. – Related: 24 Hour Locksmith Las Vegas. My next project is to install a lamp module to control three decorative lamps in our dinning room and have the ability to turn them on at dusk and turn them off at 10 pm automatically. I have the unit on hand, just waiting for the time to install it. Useful links: Check out Access locksmiths and the emergency locksmith West Palm Beach service. My name is Robert and I came across your blog looking for Wink reviews. Great blog by the way. I have a question though. I’ve ordered a Wink Relay that should be delivered tomorrow. Did you get your Wink Relay to control your ceiling fan? I understand that the Relay can’t control the speed of the fan but can it turn the fan on and off? Thanks for your response. Keep up the good work! Yes Robert, it does turn the ceiling fan on and off.